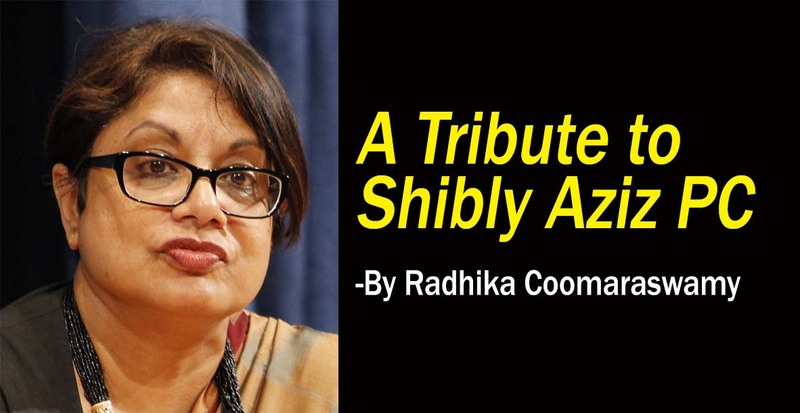 (Lanka e News -02.March.2019, 11.30PM) Speech made by Radhika Coomaraswamy at the Shibley Aziz Commemoration today. I want to thank the organizers for having invited us here today to pay tribute to this great man. I want to particularly thank Shibly Aziz’s wife Fathima. In life she was Shibly’s rock of Gibraltar and today she is the main driving force behind this event and other activities being done in his name. Shibly has talented sons and Afdhel Aziz’s book Strange Fruit once kept me company on a long flight across the Atlantic with its sensitive portrayal of people and the diversity endemic to our culture. Its story of love and loss is really a larger story of Sri Lanka; its beauty as well as its portrayal of areas that were once the heart of darkness. For a long time I knew Shibly as an acquaintance with whom I shared similar interests. We rarely met except at social events and what we discussed was not much more than the weather. So when we were put on the Constitutional Council together, I must confess we were both slightly wary of each other. After all he had been a former Attorney General whose briefs included the protection of state interest in courts of law. I came from a human rights background. Our calling, on the other hand, required us to be watchdogs of the state and its activities, contesting areas where state activities were wrong or downright criminal. Nevertheless within weeks we struck common cause. We were both strong believers in independent judiciaries and commissions. We desperately wanted institutions that would exist without bias, without political interference; judiciaries and commissions that receive the confidence of the public who saw that the decisions were fair and just. We wanted justice to be done as well as seen to be done. We felt it was our national duty. A lot of discussion these days about the Constitutional Council saddens me. I would like to say something about the Constitutional Council and Independent Commissions today because I feel that will be the best way to honour Shibly who was a fervent defender of these ideas in the sessions of the Constitutional Council. Let me say something about process. First I must reiterate that the civil society members of the Constitutional Council, such as Shibly and myself, have to be elected by Parliament. Both sets of members, present and past, were chosen by parliamentary consensus. We worked hard knowing that we had the confidence of the house. There are two ways by which you can guarantee an impartial process; the first is for Parliament to jointly choose eminent members of the public to be members of the Council without any politicians. Civil society has always maintained that this is the best form for the Constitutional Council. The other is to ensure that all political parties are present and that any nominee has to get the approval of all shades of opinion. This is then what is called a consultative and consensual process and is the present structure of the Constitutional Council. The third option that has been continually abused in the past is that the President appoints members of the judiciary and the commissions at his sole discretion without any checks and balances. This option was rejected at the 2015 election. For most of our tenure at the Constitutional Council, there were very few problems. For political reasons the trust has now been broken. It is that distrust that is tearing apart what was a normal, consultative process. Consultation requires a certain measure of good faith. If any party acts willfully and breaks that faith, then a system of consultation cannot work. We must not mistake broken trust for broken structure. Things were not perfect with the Constitutional Council process but it did work for some time and the performance of the judiciary and most of the Commissions has been a testament to that. The shortlist was thereafter submitted to the larger Council and then the members deliberated on their names. All decisions were made by consensus. Anyone who disagreed could have spoken up and all major parties were represented in addition to civil society. The names were thereafter sent to the President and he appointed them accordingly and chose one of the individuals to be the Chairperson. The process therefore involved all the major political parties, three civil society members and The President. I cannot think of a more consultative process. From my viewpoint these independent commissions have generally been a success. The Human Rights Commission, especially, has brought us a great deal of international and national kudos. But it is not the only commission that is appreciated. On a trip back from Jaffna, we got copped for speeding near Anuradhapura. My driver had not noticed that the on coming traffic was blinking their lights furiously, warning us of these cops lying in wait. Anyway we were stopped. I pulled out my ID and my Constitutional Council ID and showed them to the police as a matter of course. When the policeman saw the Constitutional Council ID he grinned. He told me how terrible it was when they had to operate under the whims and fancies of politicians and he was so pleased that there was now a Police Commission responsible for their promotions and transfers. The politicians may be unhappy about independent commissions but the police surely are not. As for judges and other appointments, it was the President who made the initial referral to us after consulting the Chief Justice and sometimes the Bar Association. It was a very professional process initially. Most of the time there were three names sent to us from which we were asked to choose one. In a very few cases there was only one name. For the most part there was no real controversy. Seniority cannot be the only basis of appointing judges; if that were the case why was it that people felt we needed Constitutional Council? Any appointment to the judiciary and the Commissions require the President’s approval and the approval of the Constitutional Council, a valid and important check and balance for those who will man our highest offices. In the appointment of judges, the Chief Executive plays the key role- we are only a check and a balance. It is only in these very politicized times that we have become the brunt of the anger of others. To disparage this process is to express a lack of understanding of how modern constitutions around the world are entrenching their independent institutions. These institutions give redress to citizens and as a result they have to play an independent watchdog role. They have to be in healthy tension with the state. They cannot be influenced or absorbed into the state. If that happens their purpose would be lost and the rule of law and the foundations of fairness and justice in society will be undermined. Justice rendered by an independent and impartial institution is one of the key demands of a modern self-aware society. Neuroscience is increasingly finding centers of the brain linked to the sense of justice in each individual. Justice is not an add on but an integral part of the human experience, a part that makes a society whole and healthy. Independent impartial institutions are the chambers where this justice is carried out and we must ensure that there is no bias, no political influence and that people are chosen on merit with seniority and experience being a factor. Shibly believed in this to the core of his being and toward the end of his life it had become a crusade, a crusade I was happy to share. In all our deliberations Dr. A.T. Ariyaratne joined us. When choosing a name, those of us from the professions tend to look at the technical points, the education and employment qualifications. It is Dr Ariyaratne who was the repository of knowledge of all the major cases that had been fought and the repercussions on the society at large. He allowed us to get a sense of judicial application on the people and the consequences of judicial action in the field. His wealth of experience and knowledge from a people’s perspective was a check on the legal and professional biases of the other Constitutional Council members. If we have a truly independent judiciary and independent commissions today- and I believe we have begun the process- much of the credit must go to Shibly Aziz. This is his legacy. Shibly, with his encyclopedic knowledge of courts, judges and the law was always there to guide us with specific names and places. His knowledge was indispensible and the Council relied a great deal on his analysis and understanding. He was fair and forthcoming about the issues and problems facing the judiciary. Though a lot has been said and one article appears after another bombarding us in the press, the calibre of judges actually chosen by the Constitutional Council is not in dispute. Shibly was a special man, a kind and generous man and also a Lion of the Bar. He had a sense of humour and a level of sensitivity. He cared about people’s sensibilities. He even stopped using certain words- favourite words of male lawyers I gather- after seeing my mortified expression when he used one of them in a Council meeting. Shibly leaves behind a great legacy that is clouded today because of the heat of the moment. But if democracy prevails in this country and if independent institutions stand strong today, Shibly Aziz must get much of the credit. He will have a cherished place in our history.